the Heaths show how everyday people-employees and managers, parents and nurses-have united both minds and, as a result, achieved dramatic results: The lowly medical interns who managed to defeat an entrenched, decades-old medical practice that was endangering patients. The home-organizing guru who developed a simple technique for overcoming the dread of housekeeping. The manager who transformed a lackadaisical customer-support team into service zealots by removing a standard tool of customer service. In a compelling, story-driven narrative, the Heaths bring together decades of counterintuitive research in psychology, sociology, and other fields to shed new light on how we can effect transformative change. Switch shows that successful changes follow a pattern, a pattern you can use to make the changes that matter to you, whether your interest is in changing the world or changing your waistline. Chip and Dan Heath are the co-authors of Made to Stick: Why Some Ideas Take Hold and Others Come Unstuck. They also write a monthly column called 'Made to Stick' for Fast Company magazine.They have spoken and consulted at organisations such as Nike, Microsoft, the Nature Conservancy, the Navy, USAID/Tanzania and the American Heart Association. Dan Heath, is an American bestselling author, and speaker. 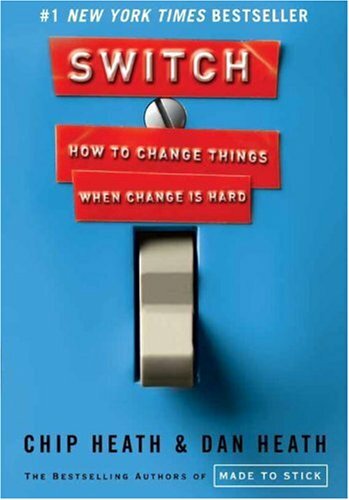 He, along with his brother Chip Heath, has co-authored three books, Switch: How to Change Things When Change Is Hard, Made to Stick: Why Some Ideas Survive and Others Die, and Decisive. He is also a columnist for Fast Company magazine. Made to Stick, was named the Best Business Book of the Year, was on the BusinessWeek bestseller list for 24 months, and has been translated into 29 languages. In 2013, his title Decisive made The New York Times Best Seller List.